Entrance hall with plenty of useful space for coats and boots storage. Cloakroom: with hand basin and WC. Understairs cupboard housing the washing machine. Open-plan sitting/dining/kitchen area: Wonderful light and spacious, sociable space with doors opening out onto the terrace. It has an oak floor and is decorated in a contemporary coastal style. There is the advantage of wireless broadband provided in Seal Cottage. Sitting area: has a brick fireplace with a wood-burning stove, 2 comfortable leather sofas, flat screen freeview TV, DVD and a selection of books & games. Glass doors open into the garden room.Dining area: has a dining table seating 6 and a large wall map, very useful for planning your days's activities! Kitchen area: modern fitted cream kitchen with granite work tops, well-equipped with gas hob and electric double oven, dishwasher, microwave and fridge. Garden room: with glass doors opening out to the terrace and also through to the sitting area. This is a superb addition to the cottage, furnished with a comfy sofa and a flat screen TV, giving guests an additional room to relax in. There is a travel cot available to use if required. Bedroom 1: King-size bed, bedside tables and lamps, wardrobe and chest of drawers. En-suite shower room: walk-in shower, hand basin and WC. Bedroom 3: Full-size bunk beds, bedside lamp and a chest of drawers. 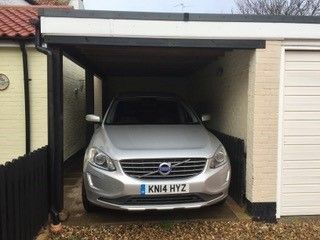 There is a private covered parking space for one car around the back of the cottage. Please note that it is quite a tight space but does have room for a large car (as per photo). There is a rear terraced area with an outside table, umbrella and chairs, as well as a charcoal barbecue. This area may be completely enclosed. Sorry, but dogs are not permitted to stay. Great cottage, Great location, very clean and well equipped. This is a beautiful cottage refurbished to a high standard and well stocked with all the basics you could need, add to that the close proximity to the town and quayside. Thank you - lovely cottage in lovely Wells. Loved it - Thanks so much. Lovely cottage- super nicely renovated and clean. Worked very well for our family. Close to everything we needed, but far enough off the harbour to be quiet and peaceful. A lovely week once again in this warm, cosy, well equipped cottage. Thank you for the milk, bread and butter on arrival - so practical to arrive to when turning up late with hungry kids. We will be back. Many Thanks. Another great weekend away, thank you for letting us stay in your lovely home. Chocolate Deli was as good as ever and the walk along the beach was as windy as ever. See you next year! Lovely house in a lovely area couldn't fault it. Would recommend Golden Fleece on the Quay for food, french's on the quay had great fish and chips. Will definitely be back. Lovely week - lots to do -saw Father Christmas arrive by boat with penguins! Lovely well equipped cottage - love wells. Thank you! I had so much fun making chocolates at the Walsingham Deli and going to Norwich was great. The beds are the most comfortable in the world. Thank you for a very enjoyable stay in this comfy cottage. A great base for a Christmas shopping weekend. Loads of nice places to eat out. Also appreciated the speedy response to our light bulb issues! Another enjoyable stay here. We really appreciated the loaf of bread and milk left for us so we celebrated with a slice of toast and a cup of tea. Never seen such a well equipped holiday cottage. Really comfortable twin beds. We engaged in our usual activities: pumpkin trail in the walled garden on the Holkham Estate, a meal on the Albertros on the sloping deck - all part of the fun. A really lovely stay - Well equipped, clean and comfy beds - We will come back. Great meals out and in the cottage too, thank you We loved the Albratros - such fun and different to anywhere we've ever been! A wonderful week in wells in a wonderful cottage! Excellent facilities and we felt very at home straight away! We will definitely come back and recommend this place to friends and family. Thank you. OMG we love Norfolk! One of the most beautiful beaches we’ve every seen. Great cottage and we loved the chocolate deli in Walsingham - would highly recommend. Lovely warm cottage with everything that was needed. Many thanks. Everything we needed in the cottage. Excellent location. Great week. Thanks. Back again in this lovely cottage. Brilliant week. We have had a lovely sunny week and agree with all previous comments about Seal Cottage. Seal Cottage is lovely and very well equipped. We would definitely come back. Thank you. What a lovely holiday cottage. Very well equipped and nicely done out. This is our second visit to Wells and we’re sure we will be back and we would definitely re-book this cottage. Had a great time in Wells. Seal Cottage was perfect for a break away from the City. Everything was lovely. Lovely cottage, easy to live in, well equipped, good location, would definitely recommend it.